Hey Strawberrys! : New Year's Resolutions....Starting Tomorrow. I am so excited for this year. As you can tell from my previous post, I'm not mourning the end of 2013. In fact, I'm quite happy to put it behind me! To stay on top of things this year, I purchased an Emily Ley Simplified Planner. I spend more time writing down the things I want to do rather than actually doing them. So this planner is perfect for that. 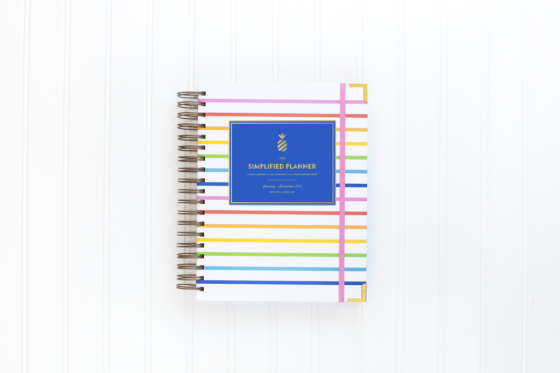 This is no ordinary planner. It's a $56 planner that turns you into Wonder Woman. Last year on New Year's day, I spent some time reflecting on the previous year and making two lists: what worked for me and what didn't work for me in 2012. Well, I didn't really do much reflecting this time around (other than blogging about "The Things that Went Wrong in 2013"). I'm just looking ahead to a brighter future! I jotted down a few goals in my planner for this coming year and I'm pretty confident that I can make them happen (fingers crossed for no major setbacks or unexpected turn of events). I just wrote one or two words for each goal - nothing specific or measurable. I'm not really concerned about that for now. I just want to have a fun year! I truly believe that God hears our prayers and I've seen it transform my life time and time again. In 2013, however, I often felt too angry or bitter to pray. There were two issues that I repeatedly prayed about, but I never got an answer. I got incredibly discouraged and ultimately gave up towards the end of the year. I'm determined not to let my disappointment get the best of me this year. Even though I've missed blogging, I've taken a much-needed hiatus. I hope to get back to it more regularly this year. Book club, I'm ready for you! I'd say I've done a lot less of this recently, but it still wouldn't hurt to cut back. It's such a time waster. I enjoy it. Especially with a glass of wine. Brian and I have several checking accounts, but one is designated solely for my use. This account is replenished once a month. I usually run out of money two days in. Unless I'm going to work, I typically put little effort towards my appearance. It's amazing how a killer outfit, good-quality makeup, and a curling iron can transform you. I'm going to start doing more cleaning throughout the week, rather than saving it for the weekends (or not doing it at all). Personally, I think our house stays pretty clean, but geez louise, Brian must notice every speck of dust! This is the one thing I'm trying to get better about for his sake. I'm against hiring a housekeeper, for now, so I've got to step up to the plate and get this done! I really cherish date nights (or date mornings or date afternoons). Basically, anytime I'm spending with Brian is my favorite time in the world. I'd like to date him a little more this year. Love this Kel! I can relate to a few of these myself!